Those whose only acquaintance with the music of Gustav Holst is confined to The Planets, will find much to enjoy in this delightful disc of his chamber music. Most of it was composed when he was in his twenties, with the Three Pieces and Terzetto being written later. The earliest work here is the Quintet in A minor for piano and wind instruments, designated as his Op. 3. It’s a student work, dating from 1896 when Holst was studying composition at the Royal College of Music in London with Stanford. In no way does the music break new ground, with the harmonies being conventional and unadventurous, yet it’s pleasingly tuneful. His use of folk-song-like themes no doubt conforms to the College’s endeavours to promote a national style. In the energetic opening movement, the bassoon and piano take on a more accompanying role, with prominence given to the oboe, clarinet and horn. The Scherzo second movement has a humorous vein running through, and its character is sprightly. Then comes a solemn Adagio followed by a cheery dance-style finale. A year before the Quintet’s composition, Holst met Vaughan Williams (1872-1958), and the two were to become firm friends. Four years later, in 1900, Holst composed his Sextet in E minor for oboe, clarinet in A, bassoon, violin, viola and cello. The work was only unearthed from the archives of the British Library around the year 2000, and published thanks to Helge Bartholomäus. Again an apprentice work, it’s cast in the traditional classical mould of four movements. The instrumental textures are fairly light, and the technical demands Holst makes of his players falls far short of virtuosic. The Adagio third movement is particularly striking, its ardent lyricism painting a scene of cold desolation. The fourth movement is a theme and variations. The work is here receiving its recording premiere, and I hope more players will take it up in the future as it pays rich dividends. I was surprised to discover that the Op. 14 Wind Quintet of 1903 has had several outings on CD. I’ve never heard any of the alternatives so I can’t compare. 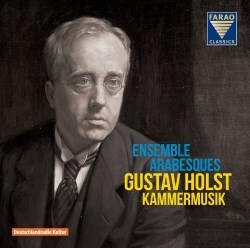 This time Holst scores for winds alone. The work was only discovered in 1978, and had to wait until 1983 for publication; the notes state that the edition excised 76 bars of it. The Quintet shows much ingenuity and invention. The first movement sounds very English in its bucolic demeanour. Holst’s love of Baroque music can be discerned in the pavane-like Adagio. As in the Sextet, the works ends with a set of variations, this time based on a folk-song theme that had been suggested to him by Vaughan Williams. The composer was in his mid-thirties when he wrote the Three Pieces for oboe and string quartet. All three are light-hearted and carefree and reveal Holst as a more than competent miniaturist. It was another fifteen years before he penned his Terzetto for flute, oboe and viola in 1925. He had compositionally come a long way in the meantime. Its claim to fame is that all three instruments play in different keys at the same time and for me it occupies a more spectacular terrain. Of the two short movements, the first is lyrical and the second is a perky scherzo with contrasting fugato and meno mosso sections. Soojin Anjoo and the Ensemble Arabesques deliver first class performances. The ensemble cannot be faulted, and they bring to this music intelligence and profound musicianship. They certainly make persuasive advocates of these alluring scores. For those who regard Holst as a ‘one-work’ composer, I would point them in the direction of this compellingly attractive music.